The PlayStation 4 and Xbox One appear to be light on party brawlers. Sure, friends can go mano-a-mano in certain fighting games, but there isn't really a game for all-out chaos aside from the rare Gang Beasts on PS4. Now it looks like Angry Mob Games is here to answer the call. On Wednesday, the indie studio announced that Brawlout would come to PlayStation 4. Some may be unfamiliar with Brawlout, but the Super Smash Bros. community may recognize it, as it's been featured at various esports events. They'll also recognize the resemblance to their favorite fighter of choice, as the idea is to bash opponents until their damage percentage increases and then knock them off the stage. The key difference is that Brawlout completely disposes of defensive tactics, doing away with blocking and shielding in favor of aggressive combos. The similarities are something that the development team are well aware of. "'Isn't this just another Smash clone?' is something we’ve heard a lot during development," said Angry Mob CEO Bogdan Iliesiu on PlayStation.Blog. "In some ways, yes, we do have elements that people loved in Smash. Character movement, Ledge grabs and even some character power sets are reminiscent of the Nintendo classic. But at its core, Smash Bros. wasn't where we dove for inspiration when thinking about the type of core mechanics we wanted to include in Brawlout. Our game more closely reflects our love for the traditional fighters like Street Fighter and Mortal Kombat. You really feel the weight of your punches and kicks-in-the-face! Plus combo-breakers! We wanted an aggressive, combo heavy game, not something that was just full of blocks and defensive stand-offs." 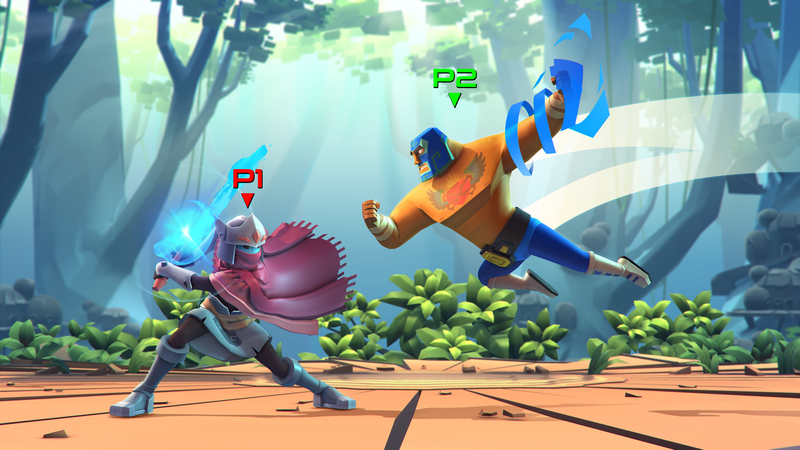 Brawlout features seven original fighters, along with several playable cameos from other indie games, like Guacamelee's Juan and Hyper Light Drifter's own Drifter. More characters are being added soon, along with various updates. Brawlout is set to come to PlayStation 4 and Xbox One this summer. For those who want to bash each other's skulls in today, the party fighter is already available on PC and Nintendo Switch, with Ranked Mode set to be introduced to the latter version with the 1.3 update dropping later this week.